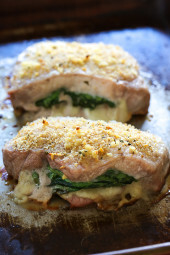 Making this right now and entered into the recipe builder. I noticed the Rosita’s non fat refried beans are not zero points. I scrolled through the comments and saw the Trader Joe’s brand is. I also used 93% turkey so I was expecting it to be 3 points, but the brand of beans I used made it 4. When you use a fattier ground meat but drain the fat really well do you still count it as the percentage you used? Beans are 0 if there is no oil. Of course, even a can of regular beans will have points if you use the calculator and the nutritional label so you have to use recipe builder. I’m sad I discovered this towards the end of soup season – it is stellar! It freezes brilliantly and is perfect for those days when I don’t have other leftovers to take for lunch. If you portion leftovers individually and freeze, move a serving to the fridge the night before and reheat in the microwave. My only changes to the recipe were to use black beans that I had on hand, instead of the kidney beans, plus adding some hot sauce because that’s my style. Gina’s homemade taco seasoning is spot on. I topped with some reduced fat colby jack, crushed tortilla strips, and scallions. Thanks for another winner! Anyone do this in the instant pot? I do this frequently in the crockpot, so I’m sure instant pot would work too! I wanted a lighter option for dinner, and I wound up making this meal and having leftover for meal prep! I follow WW Smart points, so having a 0 point option is CLUTCH. I am so beyond grateful for this recipe. It was phenomenal. This soup is sooo good!! I left out the refried beans and made my own homemade taco seasoning. I used Fire roasted frozen corn instead of plain canned corn. I garnished the soup with a few sprinkles of pepper jack cheese and a dollop of fat free Stonyfield yogurt. It was amazing!!! Thanks Gina! Try it with the refried beans – gives it such a nice texture! Absolutely amazing! This will be on a regular rotation at our house. Delicious!! I love food like this. Thank you!! My picky teenagers gave this 9/10 and an 11/10. Loved it! Will definitely make again. And again. I may have already commented on this soup but it bears repeating – Very yum! One of my favorite winter soups and easy to put together. I’ll be making another pot of it in the next day or two. 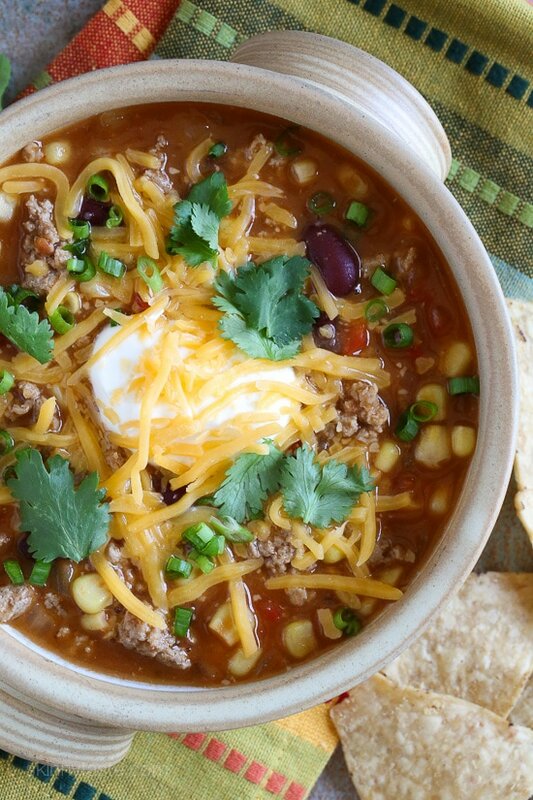 This chili is SO GOOD. I’ve been making it about once a month for my family for about 2 years now. They love it. Over time I’ve made it my own by using 2 cans of kidney beans, omitting the broth (we like it thicker) and using 2 packs of taco seasoning. Sometimes I sub regular ground turkey for Jennie-O taco flavor ground turkey and use only 1 pack of seasoning. I love this soup. I am doing Keto and have tried not adding beans but it’s not as good. Going to cut back on the beans a little. I’m not surprised it was delicious!! We love all your recipes! It turned out fantastic! I personally think most Chilis are simply too thick and don’t have an interesting taste. FYI…I did add one tablespoon of chili powder to the entire batch to zing it up a bit. Once again I have made the Turkey Taco Chili Soup. It is a favorite and every time I make, I’m always so excited —- even though I know the taste —- it is soooo goood. So warm, so much comfort in a bowl!! Thanks, again, Gina!!! Delicious. Easy, quick and flavorful. Is this. Zero points. I keep reading that others say it ranges from 2-6 points. 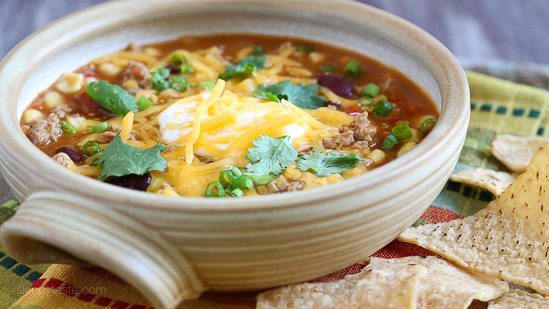 Our entire family LOVES this soup, year round. Easy, usually have all the ingredients in my cupboard. Two of our grown up kids and their families had it last weekend. It is addictive! I put everything in recipe creator and mine came up tp 2 pt. per serving. Even for 2 points it is delish! AMAZING!!!! This soup was so delicious! Will definitely be adding into my recipe rotation. 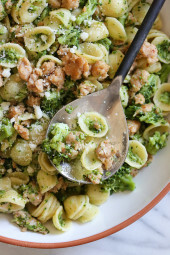 I used 93/7 ground turkey which adds points (if you’re following WW) but you absolutely cant go wrong with this recipe. So flavorful and filling. This was easy and delicious! 22 g of protein per serving! MY husband loved it too! So good! I made it in the Instant Yummy! Great dinner on a rainy night. My husband and I really enjoy a good taco soup, and this did not disappoint. Love that it is zero points on weight watchers. So we tried this last night, myself, my husband two teenage boys & a 5 year old…everyone loved it. Perfect recipe! I made this tonight. I don’t like kidney beans so I used lentils. It’s so good! My hubby ate 2 big bowls and said I should make it often. Turned out so good! I was really worried putting refried beans in a soup but wow it’s great! Would it work to substitute tofu for the ground turkey? You said this was a 0 point Freestyle WW recipe but when you add up the nutrition information it is 6 its not 0. Please explain.It’s a great recipe but not a 0 zero point one. Cannot begin to explain how delicious and filling this is! I absolutely love this, my husband did too! Will definitely make it again. Thank you, Gina! Love this recipe and the zero points! I made this just as written and it was AMAZING! I’m in an Airbnb so I don’t have a lot of extras to work with but this chili was so good and definitely will make again. YUM!!! 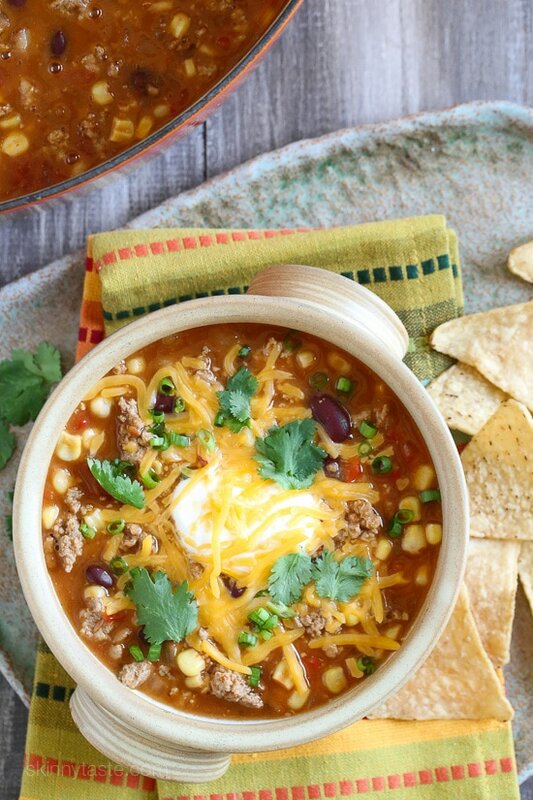 hi so i was wondering about this recipe being 0 points on ww.when i calculated it came up anywhere between 3-5 pts per serving.Its an awsome recipe dont get me wrong. The refried beans kind of act as a thickener, so if you like really thin soup you could omit. Another option would be buzzing a second can of kidney beans or black beans in the blender and adding for thickness. Has anyone used black beans instead of retried beans? Wondering if it stil tastes great. Yes I have. Also if I don’t have refried beans on hand, I add another can of kidney beans. Just started WW today and made this for my family! It’s delicious and filling and will be making it again next week!Thank you! No reason to change a thing. Lots of flavor, perfect goodness to liquid ratio.! Thanks to you! My husband HATES soup. Convincing him to eat this wasn’t easy, but we’re both glad that I persisted. He loves it! We mix the cheese and sourcream into the entire soup prior to serving. It’s amazing ! Looks delicious! Can you make this using the slow cooker? When I put the nutritional information in my WW recipe builder it came up as 5 points. Any idea why? It really is delicious! 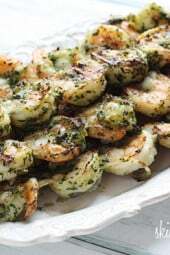 This is a fabulous recipe…flavorful, easy to make and no points. Heaven in a bowl! For someone who doesn’t like beans, this was really good!! I blended the kidney beans down to a paste and added a bit more heat with a Jalapeno. This is definitely going in to the regular rotation. Double the meat and add two packages of seasoning. My husband doesn’t like ground turkey or beans. He loved the soup! I used the retried beans but left out the other beans. After his second bowl I told him what Was in it. He declared the recipe a keeper! Delicious, easy, and freezer friendly! Couldn’t ask for a better week-night (or any night!) meal! I made this for my husband and myself last night and we both thought it was excellent. I can’t wait to have it for lunch the rest of the week! How many teaspoons or tablespoons for the taco seasoning? I don’t use packets. Thank you! It ends up being about a teaspoon and a half I believe. I make a lot of your recipes (at least 3 a week) and this is by far one of my favorites! Super filling, delicious, and the kids loved it too! Definitely going to be a staple in our house! This soup is SO GOOD, just like every recipe I cook from Skinnytaste!!!! Everyone in my house loved it! I made my own refried beans (can of pinto beans, 1 clove of garlic, a teaspoon of olive oil, cumin and a splash of lime juice) and I used homemade taco seasoning. I also added 2 tablespoons of cilantro paste because I LOVE cilantro. The cilantro made the soup tasty and really pretty with the flecks of green. This will definitely be in the fall and winter rotation! Thanks Gina! I looked at my grocery store and the closest I could find was Old El Paso which was 0.5 total fat for 1/2 cup and 0 sat fat for that serving size. If I use nutritional label entry (which counts the beans which should be zero) it would add 8+ points to the recipe total. What brand do you find that is fat free or is that close enough to be considered fat free? Rosarita refried beans has a non fat option too. I believe old El Paso does as well. I make my own refried beans with pinto beans. no fat-low sodium. I make in my crockpot and then I freeze them in separate containers the size of this recipe (16 oz). Omg!! This soup was delicious!! I’m not a huge ground turkey fan, but let me tell younow I am! Only thing I added was fresh garlic with my zester. Also, I sautéed veggies firstand added chop meat to cook after with veggies. When it was done added some low fat cheddar to my bowl.Unbelievably good! You will not be disappointed with this recipe! Wow! So yummy and easy. I did sub a poblano and a small jalapeño for the bell pepper because we like a little more heat. I love how you used refried beans!